HRI's main office is located on the campus of Indiana University in Bloomington, Indiana, USA. The institute is housed in Suite 222 of the Hillcrest Psychology Research Center, which is not open to the public. Visits are by appointment only. is the closest major airport, approximately 1 hour's drive north of Bloomington. To take the Shuttle or Limo, go to "Ground Transportation", across from Baggage Claim, outside the terminal. NOTE Park in university parking lot only if parking has been pre-arranged with HRI's director, or if you have ordered a VTO parking tag directly from IU Parking Services. Otherwise, see below for public parking information. Parking on Indiana University property requires a permit displayed on the vehicle. If your visit has been pre-arranged with HRI's director, parking accommodations will be made for you. 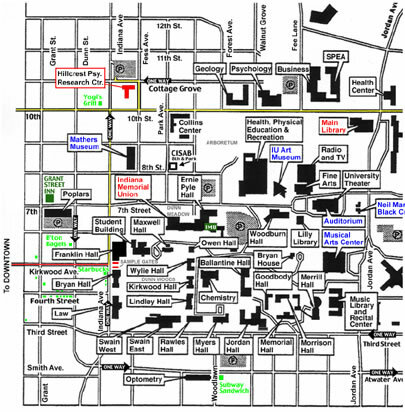 For those who wish to obtain a visitors' parking permit directly, contact IU Parking Services, Franklin Hall 006, 601 E. Kirkwood Ave., Indiana University, Bloomington, IN 47405 USA, Tel +1.812.855.9849 (office hours 8am to 5pm, Monday - Friday). Ask for a VTO (valid today only), "A" tag visitors permit ($5). This tag will allow parking in the "A" and "C" designated areas in the IU lot across from the HRI's office in Hillcrest, as well as IU's other lots and parking garages around campus. The City of Bloomington requires Neighborhood Parking Permits to park on residential streets near the university between 8am and 5pm, Monday - Friday. 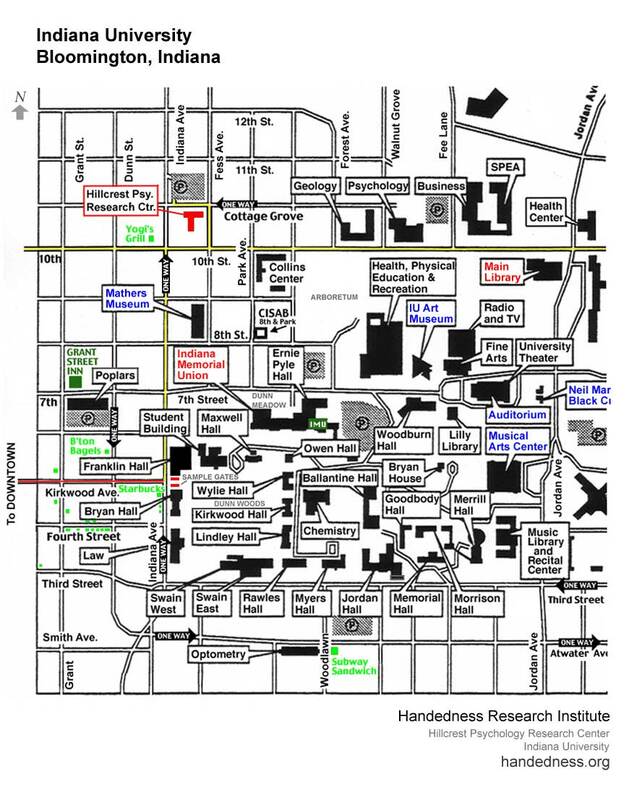 A "Zone 6" Residential Parking Permit is required for parking on streets near the Institute during these times. IUs main research collections library is the 13th largest university library in North America. Facilities also include state-of-the-art computer facilities (open 24 hours a day) and a cafeteria. Designed by I.M. Pei, and completed in 1982, the museum collection includes works by Claude Monet and Jackson Pollack in addition to works from Asia and Africa. The IU Art Museum is ranked as one of the top five university art museums along with Stanford, Harvard, Princeton, and Yale. The museum features a collection of 20,000 objects and 10,000 photographs representing cultures from each of the world's inhabited continents. Holdings include more than 1,800 ethnomusicology items (one of the largest collections in the country) and more than 8,000 images of the Wanamaker Collection of American Indian photographs. Special exhibits, gift shop, free admission. The MAC opera theatre features European-style seating for 1,460 with room for a 100-piece orchestra. The 90x60 foot stage is often compared to that of the Metropolitan Opera House in New York. The MAC is also houses studios, classrooms, and practice facilities for students of IU Bloomington's world-renouned School of Music. The MAC's front lawn is graced by a large sculpture by Alexander Calder entitled "Peau Rouge". Each year the auditorium presents off-Broadway shows, musical concerts, well-known speakers, and an assortment of entertainment. The grand lobby (decorated with 1933 Thomas Hart Benton murals) opens onto a multilevel 3,760-seat hall. The auditorium also houses the largest pipe organ in the United States. The Lilly Library is one of the premier rare book and manuscript libraries in the United States, serving an international clientele of students and scholars. Materials in the Library range from major rare books such as the New Testament of the Gutenberg Bible, the four Shakespeare folios, and Audubon's Birds of America, to medieval and renaissance manuscripts, to famous individual manuscripts such as George Washington's letter accepting the presidency of the United States, to extensive special collections in a wide variety of fields. The city of Bloomington offers numerous events and attractions, including the annual Lotus World Music Festival (September). Just a short walk from the IU campus one finds many diverse restaurants, art exhibits, and shopping downtown and along Kirkwood Avenue and 4th Street. Just outside of town, nearby forests, parks, and lakes (Lake Monroe, Lake Griffy, Lake Lemon) offer an escape for hikers, bikers, and campers. Did you know that Hoagy Carmichael got his start in Bloomington?